The Google Summer (Winter in the Southern Hemisphere) of Code� 2011 is on again and awesome news, the Haiku project is taking part for the 5th year in a row. Thanks to the participation of various individuals in the community, particularly our Google Summer of Code admin Matthew Madia and those who volunteered to become mentors, Haiku was selected as a one of the 175 mentoring organizations; out of the 417 organizations that applied. 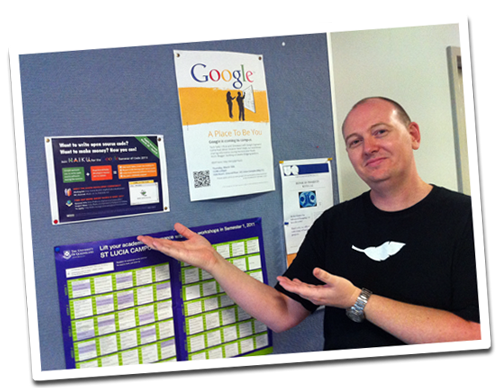 So, to honour that, I printed up Jorge Mare's flyer for the event and plastered it around the University of Queensland's IT and Electrical Engineering school, where I work.